The new German season gets underway on Saturday with the mouthwatering meeting of DFB Cup winners Borussia Dortmund and league champions Bayern Munich in the DFL Supercup (20:30 CEST/18:30 GMT). 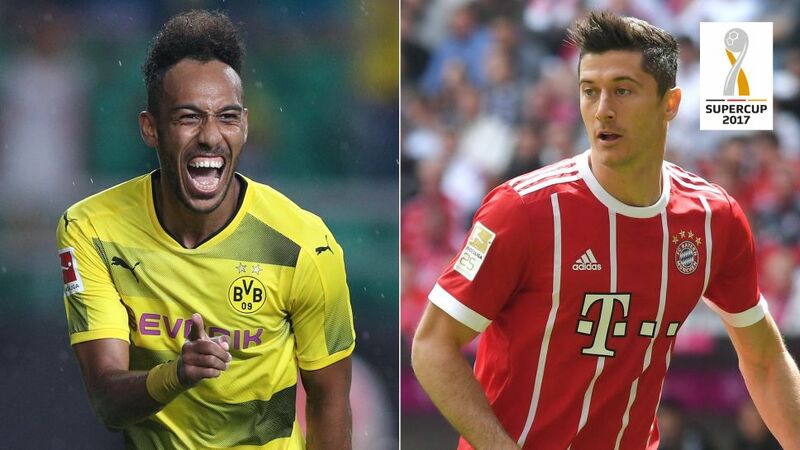 The Signal Iduna Park showpiece will also offer the chance for the Bundesliga’s two best goalscorers – Pierre-Emerick Aubameyang and Robert Lewandowski – to resume their own personal rivalry. Dortmund striker Aubameyang finished top of the pile last season, dethroning Bayern’s Lewandowski by scoring a whopping 31 goals in 32 league matches. That was six more than he had managed in the 2015/2016 campaign and was enough for the Gabon captain to claim the Torjägerkanone prize after netting one more goal than his former Dortmund team mate. Watch: All 31 of Aubameyang's goals in 2016/17! The pair obviously enjoy the thrill of their goalscoring contests as Aubameyang highlighted by tweeting Lewandowski after Matchday 1 last season, when the Bayern forward opened with a hat-trick in a 6-0 win over Werder Bremen. “Wow and the race is started,” Aubameyang wrote. When the Dortmund star replied the next day with a brace in a 2-1 success against Mainz, Lewandowski jokingly pointed out on Twitter that he was 3-2 up following round one. The goals kept flowing for the Poland inernational but Aubameyang responded with four in Dortmund’s 5-2 hammering of Hamburg in November. Lewandowski scored 74 goals in 131 matches during his four years at Dortmund, but at the start of March Aubameyang made it 75 in 118 games with a double in a 6-2 win over Bayer Leverkusen. The former Saint-Etienne player’s 20th and 21st goals of the campaign also put him two clear of his rival in the scoring charts. Lewandowski, who was the league’s top scorer in 2013/2014 while still at Dortmund, was aiming to become the first man to claim the top prize two years in a row since Leverkusen’s Ulf Kirsten did so in 1997 and 1998. Watch: Every one of Lewandowski's 30 strikes in 2016/17! By Matchday 33, Lewandowski was back out in front after finding the net twice in Bayern’s thrilling 5-4 win at nearest challengers RB Leipzig. It was the eleventh time he had scored at least twice in the league last season, and it also made him the first man to score 30 Bundesliga goals two years in a row since Bayern legend Gerd Müller did so in the mid-1970s. Lewandowski failed to get on the scoresheet in a the champions’ 4-1 triumph over Freiburg on the final day of the season, however, meaning Aubameyang finished one ahead of him after another double in Dortmund’s 4-3 win against Werder Bremen. Only two of Aubameyang’s 31 strikes were from the penalty spot and he was awarded the Torjägerkanone trophy after scoring in 22 different league matches. “It’s a great night,” he said. “We finished third and qualified directly for the Champions League and I won this trophy so it’s a great feeling.” He became the second African player to win the top goalscoring prize after Ghanaian striker Tony Yeboah did so twice with Eintracht Frankfurt in the mid-1990s. Lewandowski was quick to tweet out congratulations to his former colleague, although he no doubt felt his chances were hampered by Bayern sealing the title so early. The prolific Pole will want to win back his goalscoring crown this season and he is happy that Aubameyang is sticking around to give him further motivation. “It is good for the Bundesliga that he is staying,” Lewandowski told Sportbild last month. Both players are now 28 and at the peak of their game so next season’s goalscoring race promises to be every bit as compelling. Let the battle commence. Click here for more on the Supercup!